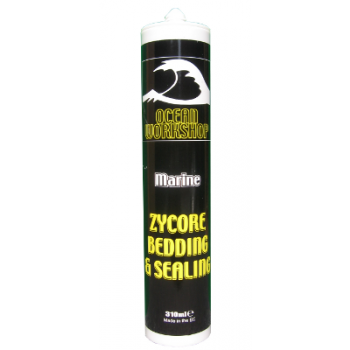 A high performance bedding and sealing adhesive based on MS polymer technology, Zycore Bedding and Sealing is easy to apply and cures quickly. Use it to seal and bed deck and hull fittings, as well as applying a water tight seal to windows and hatches. Bonds to metals, fibreglass, wood and most plastics. Ensure the surface is clean, dry and grease free. Apply as required to one surface. Assemble parts by pressing into place, leaving a minimum layer of 1mm. Remove excess and smooth exposed surfaces with water. Zycore must be over-painted within six hours of application. If painting outside six hours, abrade with fine abrasive paper first. Application temperature: +5°C to +40°C. Skins in one hour, cures fully after 2 to 5 days, depending on thickness applied.